Slips, trips and falls are more common than you think, according to the National Institute for Occupational Safety and Health (NOISH). Make sure the lighting is adequate in all areas, with replacement bulbs always at the ready. Keep other utilities like water, electricity and plumbing in working order. Clear all walkways of clutter and debris. Secure electrical cords so that no one trips on them. Check for fire hazards like loose wires, improper chemical storage, combustible materials and more. Ensure that you have several clearly marked exits and fire extinguishers that are easy to reach. Take preventive action against crime with surveillance cameras and alarm systems. Keep your air filters clean and clear. Well-circulated air vents out mold, fungus and harmful bacteria. Post barriers and signs at all areas where spills and damaged goods are. 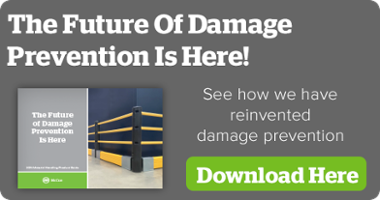 Protect pallets and warehouse goods from heavy machinery with protective guards, railings and bollards. Place water-resistant mats and flooring near entrances and exits leading out of your business. Keep the floor clean and dry at all times. Provide safety training for all employees. Have your employer develop a daily checklist for all areas, delegated to appropriate employees. Always keep the safety of your business, employees and customers in mind. And come up with new strategies to tackle these hazards. At McCue, we innovate solutions for retail safety every day. Check out our entire line of products and contact us today to get a quote.